Debashish Bhattacharya: chaturangui, National guitar; Anders Lonne Gronseth: tenor and soprano saxophone; Kenny Wessell: electric guitar; Subhasis Bhattacharya: tabla, percussion. Recorded White Plains, New York, October 2003; Livingston, New Jersey, October 2006; Audio Center, Kolkata, February, 2014; Oslo, April 2015. Debashish Bhattacharya has, for some 30 years, been cementing his reputation as a premier interpreter of Indian classical music. With his brother, Subhasis, his group Calcutta Chronicles have been experimenting with the mixing of raga with other musicals styles, particularly from Spain and South America. Anders Gronseth has, particularly in his mini-micro ensemble pieces (reviewed on JazzViews), been exploring the improvisational potentials of the overlap between jazz and raga. So, it seemed almost inevitable that their paths would cross – or, as the recording dates here suggest, keep crossing over the past dozen or more years. 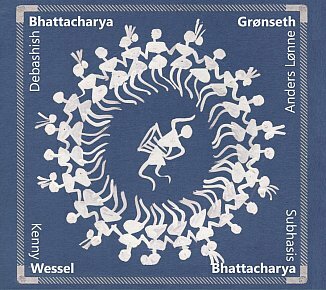 As Wessell is a long-term collaborator of Bhattacharya’s, the group more or less forms itself. Bhattacharya plays the chaturangui that he has developed, a 22-string slide guitar. It has a soft edge than the sitar which, in his hands, has a mournful quality that blends splendidly with the sensitive Americana tones that jazz legend Wessell (known to me from his time with Ornette Coleman’s Prime Time band) brings to his playing. Indeed, as Wessell and Bhattacharya (playing a National guitar) trade licks, it is can be tricky to spot who is playing. Across the pieces, Gronseth’s saxophone flutters like a hummingbird, dipping in and out of the meandering flow of notes from the strings. Behind all of this, driving the music forward is the tabla playing that takes the role of a Greek chorus, chatting away in the background, commenting on what the others are doing and always edging the music into interesting new corners and spaces. The pieces begin with a gentle introduction from one or other of the guitars, which builds through the tabla playing to increasing intensity, although never frenzied or out of control. The set ends with a version of the US Folk song ‘Goodnight Irene’. This is a much slower version than the original Leadbelly one, more along the mournful lines of the version by Tom Waits. What is so interesting about these pieces is that it is so very difficult to pigeon-hole them into any category that had been previously defined as ‘indo-jazz fusion’; not to denigrate any work what had come under that heading, but more to point out the originality of the work of this integration of talented musicians deeply immersed in each other’s musical traditions.